April 17, 2011 was last Sunday - the day that our four year temporary residency visa to South Africa expired. I can't believe we've been here four years. Thanks to Mario, we now have a new (or "re-newed") visa, but not our permanent residency permit that we applied for in January. The red bureaucratic tape of staying here has been a nightmare, but since we are determined to live out what God wants for us here...we press through as best as we can. A few weeks ago, Mario took a day off "eldering" and made his way to Johannesburg Central to stand in line at the Bureau of Home Affairs in order to extend our visa, since it looked like ours would expire before permanent residency was granted. He parked his car at 8:30 and waited in the longest line he had ever waited in - finally leaving at 5:00 pm. The Bureau (known for its inefficiency already) was unprepared for the deluge of people there, and Mario wondered why the crowded offices had a line extending to the sunny street corner where he could feel a sunburn affecting him. Asking the person next to him if it was always like this, they answered him, "No, never! This is just a rush of people wanting to process before April first." The Bureau (un-beknownst to us) had announced a few days before that the fees on all paperwork, from Marriage licenses to passport applications would increase 300% - and Mario was caught up in a storm of people determined to beat the deadline before the price went up. The lines moving slowly were the least bothersome thing that day for Mario... a wait that long brings out the worst in people. Those who are waiting and those who are serving were losing their tempers or being difficult. A wait that long would stress most people. At the end of the day, Mario emerged with a receipt of payment, a reference number, and a smile from ear to ear. He considered himself blessed, even though we had just spent 900 rand because the same department was too slow to process our permanent residency permit that we had spent fifteen hundred rand four months before. In all honesty, it has been a battle in the last year to remain focused on the will of God 24/7. I get homesick and miss my family. I get discouraged in well-doing, like the Word of God says I shouldn't. I wish I were more like Amy Carmichael or Jackie Pullinger - dug in deeply - and refusing to call any place but heaven my home. I want to be the powerful, blinding container of God's presence that I know He intends me to be... and sometimes my flame in the container is flickering meagerly, as if it is tired and worn out. A few nights later, upon voicing this, Mario and I decided to pray for my attitude...together. I was strangely comforted. Even during the worst times (Want to know what the worst times are? They are when something terrible happens to one of your kids or siblings at home and you can't be there because you can't afford to hop on a plane...and at the same time the people you have chosen to live amongst forget the love of God or the grace of God or the presence of God and they'd rather talk about how you should be more like ______ who is really sold out for God ) I know...God is not finished painting with us here. I know it's not forever, but we are supposed to be here for now...and doing exactly what we are doing. On most days, we are blessed beyond belief. Busy, yes, but happy in the knowledge that we are both, as a team, part of a team that is working out really great and beautiful things....with God. After prayer, after a reality check...I reflected. Seeing last year turn over to this year, is seeing the night turn over to the dawn. I see God moving and showing me more of His plan. Through it all, I realized that Mario has never wavered...although he's hated my "flickering faith". In realizing that both God and my husband are more that promise keepers, I found rest. A few days ago, I went shopping for a basket for Easter at the SPCA thrift store. I always look at the dogs while I'm there, mainly because that's how I found Zuzu. I hadn't found a match for our dog yet, but I wasn't ruling it out. Instead of finding one there, I came home to research Zuzu's breed, a Miniature Pinscher. 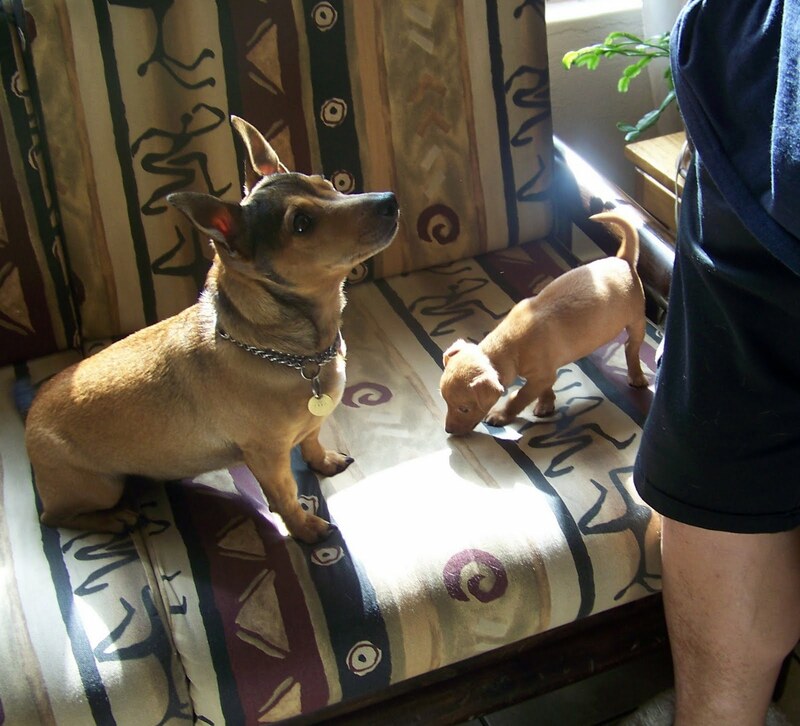 In doing so, I found Min-pin puppies for sale down the road. 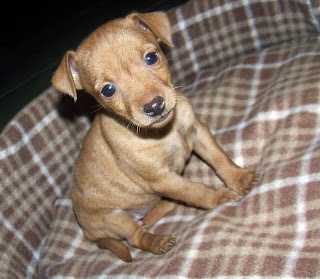 It didn't take long for us to go look at the litter, a bunch of min-pin mixes that were adoreable. We ended up buying one. We named her Peaches...and we've had her for two days. We don't have permanent residency, but we have a puppy. Hey, I'm as dug in as it gets. We have a puppy also, :) His names is Eddie. We got him for Christmas...he was 12 weeks then and 22lbs. He is almost 7 months now and is 70lbs. We love him so. Aren't puppies the BEST?